Everyday someone visits this site asking if you can enamel on brass. Recently I had the pleasure of meeting Barbara Lewis whom has not only developed torch firing enamels but has produced a line of brass jewels for enameling. Check out her store where you can pick up and the supplies and instruction you need to achieve enameling on brass! She sells Thompson’s Unleaded Enamels for this so if you already have your enamels get some of her brass jewels and get started enameling on brass! This process is an old photographic printing technique, and I learned it from Gretchen Goss in a workshop she gave in Oakland, California in 2009. She adapted it from photography colleagues at the Cleveland Institute of Art. I have always been interested in creating images in enamel and this process, though it can be labour intensive, captured my imagination and so I have continued my learning and experimentation in my own studio. I have created a line of jewelery based on the famous swans we have here in Stratford (some of them come down our stream to visit my studio) and on theatre related images. ● for all other images: using photoshop or other photo editing program, convert to greyscale, increase the contrast, resize to the size of your finished piece and finally, invert the image so it is a negative. ● using a funnel, pour the solution into a clearly marked darkened plastic bottle. It will store for some time. 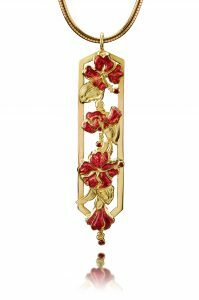 The Hibiscus are chased on 18k gold. Then the surface is depleted by heating to 800 degrees and dipped in nitric acid repeated times until there is no fire scale. A layer of flux for gold is applied which is Bovano #2 then the red enamel in two layers. Tom enameling his Sterling Silver Egg. He has made this to support a gorgeous Chased Gold and Blue Lapis with Diamond Bracelet. I asked Tom how he planned to enamel this sterling silver egg. He plans to paint Klyre Fire on and sift the enamels. I asked are you planning to counter enamel it? And he said he did not want to. But he knew he wanted opaque enamels. Here you can see the egg open, and a bit more of the bracelet. Tom has some leaded enamels with several shades of blue. He is going for a look, close to that of the lapis. I mentioned he would need to deplete the surface. This means to raise the fine silver by heating to a red glow and quenching it in acid or pickle bath. He is removing the copper from the surface so the enamel will adhere to it. I have read it can take 4 times. I use 18k gold in my work and when I want to remove the copper in the surface layer before I begin enameling, I have had best results heating and quenching 7 – 10 times. Tom has enameled and started sanding to get his final finish on the enamel, using sanding pads and in his last application he plans to use cerium oxide. In this case it is not necessary to counter enamel this piece because it is domed and he is only apply a thin coat of enamel. Remember thick metal = thin enamel. He did not have to use flux because his choice of blue will not burn against the silver. But he is unhappy with the uneven surface of the enamels, and believes he had some soft and some hard firing in the group. After several attempts to sand and re – fire the enamels still are not smooth. An option at this point could be to apply a top coat such as Ninomiya N4. that is a soft firing enamel. With his multiple firing bubbles started forming. The depleted surface on the sterling silver was not sufficient, for this many firings. He was heating at 1450 for up to 5 minutes. One thing I have found to avoid some of the bubbles would be to raise the temperature thus shortening the firing time. The enamels on the surface will melt faster and give the underneath metal less time to heat. At this point he has to clean or break any bubbles that might hit the surface on this last firing of a soft enamel. A soft enamel means it will flow at a faster rate than a medium enamel thus not firing long enough for the bubbles to resurface. And a beautiful Enamel Jewel! Argentium 970 is currently sold in grain and only from this one dealer, G&S Metals. I just spoke with them and asked why they do not offer it in sheet and other forms. The answer was they have not had the request for offering it. I explained the interest of enamelist. And was told they have a blog on the home page top left. They would be happy to listen.So enamelist here is an opportunity. www.gsgold.com/ blog away! I will purchase the grain and start some testing for plique a jour. I do not see a need for cloisonne as fine silver is great. But it would also be a good metal for vessels.